In the past,I've used my slow cooker/crockpot and oven to prepare this dish. This time around, I used my Instant Pot and loved the time I saved. It's truly a comforting, filling and hearty dish. We loved this over mashed potaoes but it works well with polenta or rice too! If you don't have an Instant Pot, you can get the traditional oven recipe version and slow cooker/crockpot recipe version here! Season the ribs with salt and pepper to your tastes. Press SAUTE on the IP and add the olive oil. Once hot, add the seasoned ribs, brown and set aside on a plate. After all ribs have been browned, to the empty IP, add the onion, celery and carrots and saute until softened. Add the garlic and flour; scraping the bottom bits for flavor. Stir in the wine from the pan, the chicken broth, tomatoes, rosemary, thyme, bay leaves, tomato paste and salt and pepper to taste. Return the short ribs to the IP. When the IP beeps after pressure cooking for 45 minutes, allow your IP to naturally release pressure for 15 minutes. While naturally releasing pressure (also known as NPR or NR), the display will reflect numbers counting up from 1. The numbers indicate how many minutes the IP has stopped cooking since it beeped (or how many minutes it has been naturally releasing pressure). No need to touch your IP while it naturally releases pressure. The pin at the top of your IP will drop when all pressure has been released and it's safe to open. 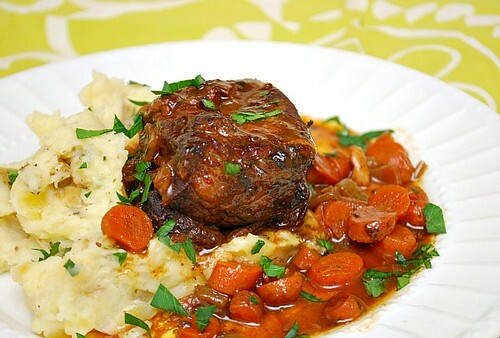 Serve ribs with your favorite side dishes - we love it with mashed potatoes and carrots! If using boneless short ribs, should I adjust the cooking time at all?